I’ve build a bunch of printers by now, but this is my first CoreXY. I had read quite a bit about it, and also looked at a lot of photos trying to figure out some nice ways to put on the belts. What I entirely missed was the requirment that all belts, aside from the rear/far right on my printer, must meet the bearings at a straight angle, and leave it at a straight angle as well, which mine did not do (still don’t). This led to some extra hours of tinkering, as I posted some photos online to get some input after my first draft. I came up a piece of metal for each of the far corners, which I can tilt as needed, to make the inner bearings to line up perfectly with the X sliders. At my first draft I also had the far ends (away from motors) in two levels, in order for the belts to pass each other. I later learned I could twist the belts to make them cross on the same level. It is ok to make one of the outer corner idlers a tiny tad lower or higher to make a bit more clearance for the belts. I have ordered some teethed idler pulleys with bearings in them, as I need 4 of those for the idler-posts, where the teeth-side of the belts are touching the bearings. I always close up my printers. Or semi closeup as I do not cover the top usually. 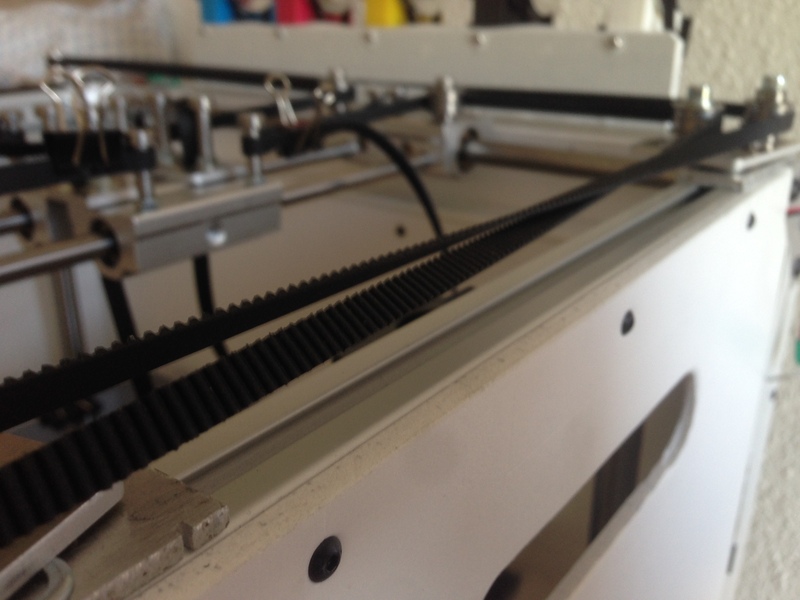 This helps keeping a stable temperature in the now-chamber, and greatly enhance the print-quality. Also for PLA. It also makes it possible to open windows right next to the printer, which is nice. I cut up some acrylic plate I had to match the front, marked up 3 holes on each side, did a 3mm pilot hole and then almost drilled through using an 8mm drill, which fits the round magnets I have on hand. 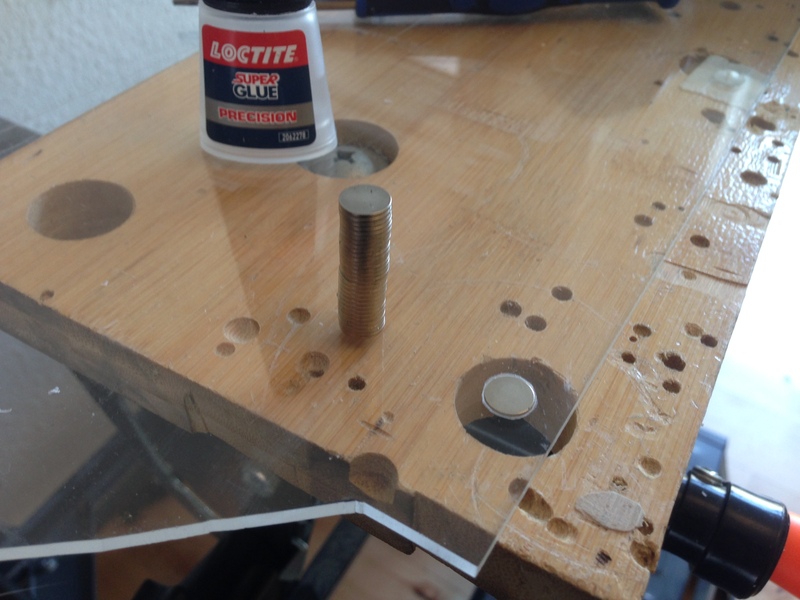 Note: I use some old dull metal drill-bits when drilling in Acrylic materials. It works a charm without ruining it. Don’t despair if you happend to drill all the way through.. I did it myself a couple of times. I’m using 2 magnets pr. hole, as they aren’t very strong individually. Put a tiny drop of loctite between the two and some locticte in the hole as well. You can see how this one is drilled all the way through, so just make sure to get some on the edges. Here’s the final piece. 2×3 magnets pr side – you might wonder how it sticks to my aluminium case? A few posts back, I put on some black glue-on magnet strips I bought for some PC Mod a few years back. They are very weak, but enough for this job. Was looking forward to write this post as yet a milestone in my project, but it didn’t turn out quite as I wanted. Instead of yet a post going through how everything is just working as it should and all my planning comes perfectly together, this blogpost is about the planning and work -process – and why it failed. To sum up, this is one of those blog-posts most people do not publish, but which is important to show we learn through or failures. Getting started – What needs done? As a starting point I admit I didn’t draw up any fancy drawings before drilling the holes. I made one for this post, of what I had in mind, more or less. I didn’t do this earlier, as (I just wanted to get started) the only important point was that all holes MUST be placed at the same distance from the upper/lower edges, or the rods wouldn’t go horisontally across and connect with the opposite positioned slider. It wasn’t crucial wheter the holes was more or less accurate from the sides. 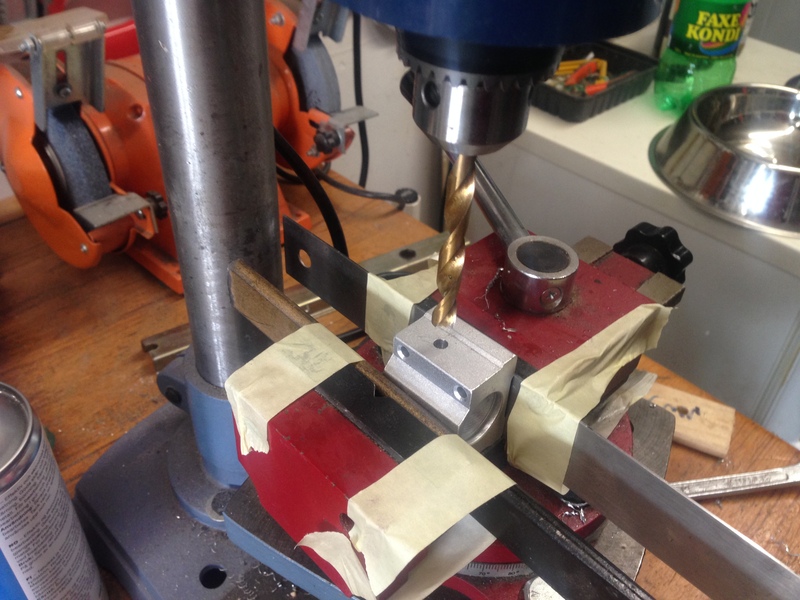 The holes must offcourse also be drilled in at a right angle on both planes, or the rods would angle either to one of the sides or up or down when mounted.. and thus wouldn’t connect with the slider’s partner on the other side. I’m not much of an accurate handyman. Get me right, I grew up on a farm and can use pretty much every tool around, but I can’t make anything fancy or overly accurate, which is also why I sourced my Z-stage plate for someone who knew what he and his CNC was doing. You can see I have drawn some lines on the sliders, which means I did try to get the holes placed the same on the sliders, but what really matters is the sides. In order to get the sides completely flat I used 2 pieces of metal used to measure stuff, so they are very flat, and should ensure a pair pretty good planes to position my sliders up against. I also did my best making the sliders rest firmly on the bottom of the wise. 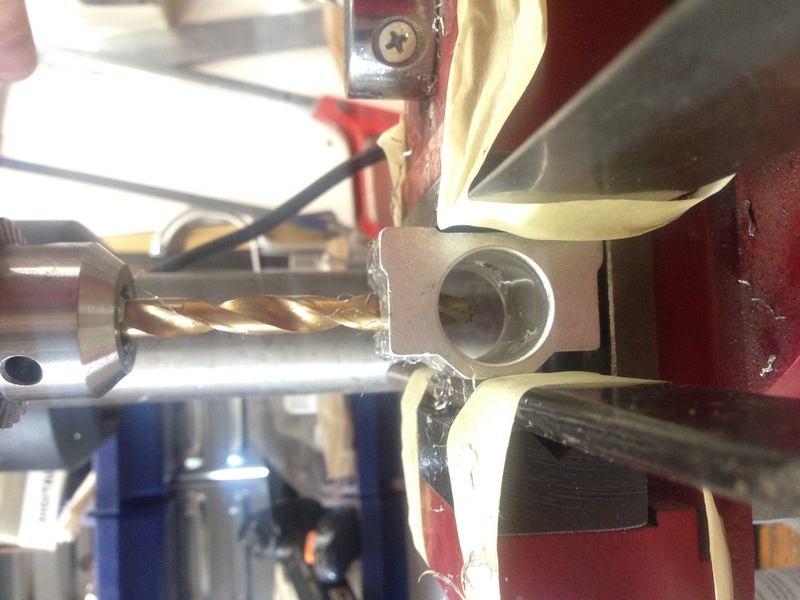 I started drillin a pilot hole of 3mm. It went in very smoothly while using cutting lubrications – I’ve previously used oil or whatever other lubricant I had on hand, but I can warmly recommend buying some proper cutting oil, if it is somethiing you do now and then.. it really makes a big difference! Drilled a medium hole on the first slider.. I didn’t repeat this on the other parts as the drills really went through very smoothly. 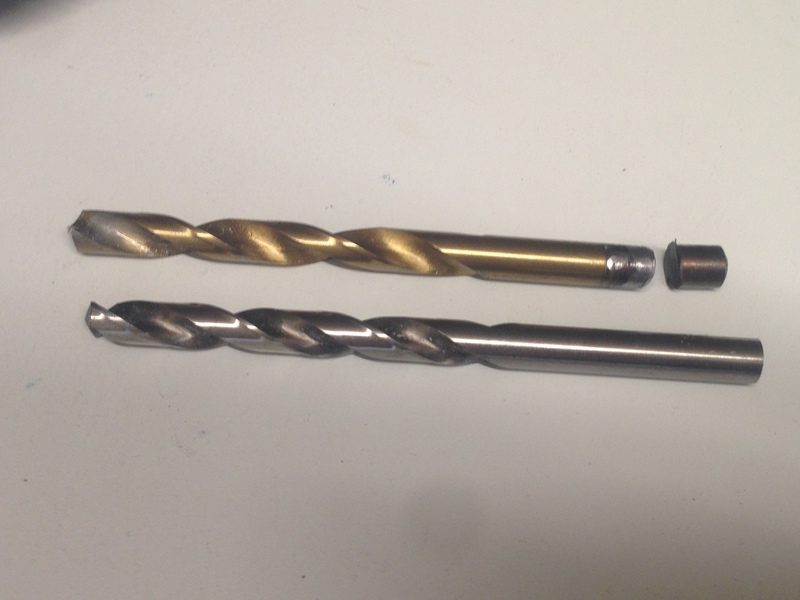 My 8mm drill was too long to fit into the drill-press, so I actually had to find a grinder and cut off the end of one of my drill bit.. meaning my good one wasn’t in action today. Result seen from the end. You can see how the slider doesn’t rest a lot on the lower part. so next up are a quartet of 2,5mm holes. In order to make some thread for set-screws I use some tapping pieces and my small power-drill set at a low torque. It’s important to set it at a low torque so it stops if you can’t feel it needs to stop, or you risk stripping your nice threads before they are completely made. First up I used the tapping piece with the least grooves in it. You can see it in the machine.. almost looks as if it’s ruined, but it is supposed to look that way. This bit is put through first, as it requires the least force. Next up I use the actual m3 tapping bit. You can see how it has threadding grooves all the way along its length. I know the hole is not square with the slider, but these set-screw holes doesn’t need to be square as the screws just needs to hold the 8mm rods in place. With all the nasty stuff finished I need to clean off the oils metal parts, so washing the rods and sliders using dishwater soap and hot water. Made sure the 8mm rods could go through. If there was a small edge or otherwise, I used my dremel to clear the way. Don’t overdo it! …and later found some actual set/grub-screws instead of normal screws. Time to put everything together. Now you might wonder what went wrong, as it all seemed to go just fine. Putting the 8mm hole all the way through, would mean you can make the same hole on all 4 and not 2 different sets. It becuase more obvious that you want the set-screw on the other side, meaning up top instead of just the side with least distance. If it was just the 2 above reasons I could live with it, but the main problem was the propability for accuracty issues. I had it completely sorted on the two sides where I put up steel plates, which ensured a completely flat and accuracte grib, but I failed to recognize how the sliders must have been lifted slightly when I tightened up the grib. I did make sure the nearest corner, which was visible to me, was touching the bottom, but judging by the result, the far corner was not always in the right spot. I was supposed to receive the sliders today that I sent to the CNC guy.. but I haven’t received them, so going to post this now, and do a new post on the assembling of the XY axes.